Cubert J. Farnsworth is a clone of Professor Hubert J. Farnsworth, and is often referred to as his son. He is heir to Planet Express and the Professor's fortune, being, along with the Professor's parents, one of the Professor's closest living relatives. He spends most of his time with the Planet Express crew criticising everything and routinely pointing out logical fallacies. At first Cubert did not want to follow in his father's footsteps and become a scientist, thinking that scientists were useless. However he eventually changed his mind and said he wanted to be just like Hubert. Though he is a clone, Cubert and Hubert act as though they are father and son. Cubert's best friend is Dwight Conrad. Cubert is regarded as uncool and unpopular among other children and is often picked on by Brett Blob. At one point, he and Dwight attacked Brett with salt which affected the slimy alien in a similar way it affects a slug, though Brett was able to recover from it before long. Cubert is also often nasty and derisive to the other members of Planet Express, frequently pointing out their flaws in a nasty manner or insulting them just for the sake of it. Cubert often likes to snort like a pig to emphasize when he's being sarcastic or to point out the obvious. 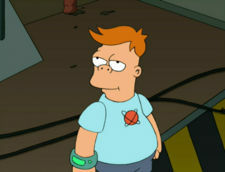 Cubert is an overweight boy with ginger hair in a style similar to Fry's, and can be recognized by his turquoise t-shirt with an atom in the center, gray shorts and red sneakers with no socks. Professor Farnsworth, identical DNA, "father"
Cubert was originally supposed to appear in "A Big Piece of Garbage", but his appearance in that episode would have made the episode at least an hour long. Cubert's purpose was originally to appear in almost every episode, constantly pointing out flaws in the logic of the Futurama universe (such as odour travelling through space or flying faster than the speed of light), but even the writers got annoyed with this and feared the audience would despise him beyond his intention. His character developed further in "The Route of All Evil" and "Bender Should Not Be Allowed on Television", distancing from his original purpose of pointing out flaws to be a real child representation of the Professor. Cubert may be missing a toe (4ACV07). The rest of the characters have progressed in some way, i.e: The Professor saying he is 165 in Bender's Game as opposed to 160, Cubert remains the exact same as in his first appearance, he had only turned 13 in "Bender Should Not Be Allowed on Television". He is one among few Futurama male characters to be voiced by women. Despite being a clone, he does not have the Professor's nose. The reason is because the Professor left Cubert in his first tube for too long and got squished against the sides. He also apparently does not have the Professor's eyes, either, as he does not wear coke bottle glasses like the Professor (and the idea of there being contacts with the same prescription as those glasses is just plain preposterous!). He is (or at least was) a bed wetter, accidentally stated by Bender. He has been non-canonically killed twice - by Leela (2ACV16) and by Dr. Zoidberg (6ACV26). In subtitles, his name is spelt Qbert. He did not appear once in the first half of Season 7 (7ACV01 to 7ACV13); the canonicity of his only appearance in the second half, 7ACV19, is debatable. Cubert can be considered the Futurama equivalent of Bart Simpson, from The Simpsons, another Matt Groening cartoon. His voice is very similar to that of Phil Deville from Rugrats, who is also a boy character voiced by Kath Soucie. Cubert: What? You've never seen a genius's wiener before? Fry: ...All the family the other has. Unless you count Cubert. Hermes: No one ever has. Why start now? Professor Farnsworth: Nothing is impossible, not if you can imagine it. That's what being a scientist is all about. Cubert: No, that's what being a magical ELF is all about. Fry: We've gotta get him back. Cubert: Impossible! No one knows where they take those old geezers. Fry: Nothing is impossible. You'd know that if you really took after the Professor, like I do. Cubert: You're his uncle, dummy. HE takes after YOU. Cubert: Hey, Leela, help me apply these flame decals I got in my cereal. They'll make the ship go faster. Leela: And what's your scientific basis for thinking that? Cohen, David. Commentary for "A Big Piece of Garbage" on Volume One, disc 2. ^ a b Cohen, David. Commentary for "A Clone of My Own" on Volume Two, disc 3. This page was last edited on 6 February 2018, at 19:25.